The Hideaway is at the northern edge of Embo, right beside the beach. 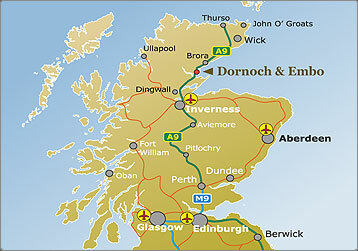 Embo is 4km north of Dornoch, to the east of the main A9 road. Inverness international airport is 45 miles to the south. The nearest rail stations are at Golspie (8 miles) and Tain (11 miles). Dornoch has an airstrip for light aircraft and helicopters.